The Type N hammer is designed for testing concrete items 4” (100 mm) or more in thickness, or concrete with a maximum particle size less than or equal to 1.25” (32 mm). The Type L hammer operates with significant lower impact energy, making this hammer the ideal option for testing thin walled items with a thickness between 2” and 4” (50 to 100 mm) or for testing small components. 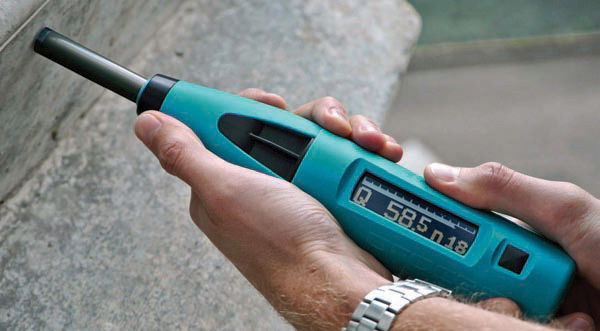 The Type L is suitable for testing cast stone components which are sensitive to impact. In rock mechanics, the Type L hammers are commonly used for classification testing of rock cores and brittle rock. 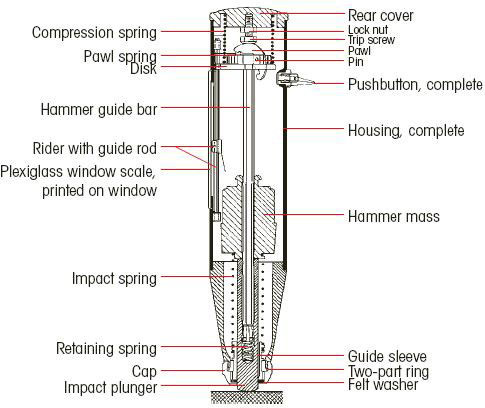 To operate, place impact plunger against test surface and apply pressure until plunger disappears; hammer will release. Scale pointer reading gives rebound value in percent of the forward movement of the hammer mass. Includes grinding stone, plastic case and instruction manual. Hardened steel test anvil used for periodic performance tests and on the HA-832000 series (type “N” only) test hammers. Shipping weight is 49 lbs. (22.2 kg). Refer to ASTM C 805 for instructions. 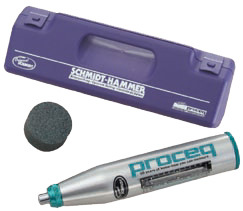 HA-832001 - Original Schmidt Concrete Hammer, Type N (PSI) consisting of: test hammer, carrying case, grinding stone and operating instructions. HA-832003 - Concrete Test Hammer, Type N consisting of: test hammer, carrying case, grinding stone, operating instructions and certificate. HA-834211 - Original Schmidt Concrete Hammer, Type L consisting of: test hammer, carrying case, grinding stone and operating instructions. The SilverSchmidt features true Rebound Value, unmatched Repeatability and intuitive Operation all in a rugged and ergonomic Unit. 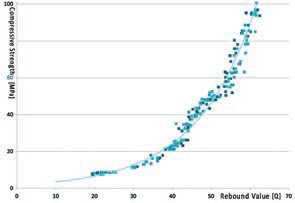 The rebound value is dependent on the impact direction. The rebound value is affected by internal friction. Limited tightness of sealing causes premature loss of accuracy. The unique design and high quality construction of the SilverSchmidt address all of these issues and makes rebound hammer testing quicker and more accurate than ever before. Ergonomics: The SilverSchmidt body lies very comfortably in the hand. The display is highly readable under any conditions. Robustness: A two-layer seal prevents dust and dirt from penetrating to the interior of the instrument. Impact direction independence: The forward and the rebound velocity of the hammer mass are both measured in close proximity to the point of impact. The rebound value requires no angular correction. Measurement accuracy and repeatability: The new measurement principle and the design of the mechanics enable the SilverSchmidt to ouperform its predecessors. Objective evaluation: A larger number of measurement points can be easily collected by the instrument and automatically evaluated according to statistical criteria. are also possible over this connection. Velocity based detection of the rebound quotient. The lightweight hybrid design of the impact plunger is made from aerospace alloy, matched to the elastic properties of the concrete and equipped with a hardened steel cap. The language independent user interface is simple to use and provides all of the functionality necessary for a rapid assessment of the structure. An inclination sensor allows the user to navigate from left to right within the menu. By depressing the single push-button (SELECT), the particular function is activated. The menu structure is simple, similar to the interface of a mobile phone. Practically every command can be activated either directly or via no more than 2 consecutive steps. Pre-programmed statistical methods in-line with all of the major standards allows an error-free, rapid determination of the rebound value. Summary views in Hammerlink make uniformity testing a simple matter. Reduced dispersion and direct conversion to compressive strength based on validated curves, regional curves or user defined curves bring improved accuracy to compressive strength estimates. The Windows based software Hammerlink unlocks the full capabilities of the SilverSchmidt, making it an even more powerful instrument for structural assessment (SilverSchmidt PC version only). System requirements: Windows 10, Windows XP, Windows Vista, Windows 7, USB-connector. 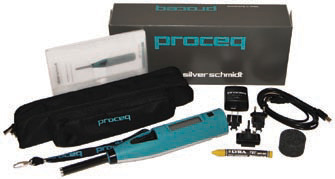 An internet connection is necessary for automatic Hammerlink software updates and for SilverSchmidt firmware updates (using PqUpgrade), if available. PDF Reader is required to show the “Help Manual”. ST Standard model. Software provided for performing firmware upgrades and selecting presets only. PC Extended memory usage. Custom curves. Download to PC. Full Hammerlink Software functionality. N-Type standard impact energy. The test object should have a min. thickness of 100 mm and be firmly fixed in the structure. L-Type low impact energy. Suitable for brittle objects or structures less than 100 mm thick. Extended warranty: When acquiring a SilverSchmidt, max. 3 additional years of warranty coverage can be purchased (for the elctronic portion of the instrument). The additional warranty must be requested at time of purchase or within 90 days of purchase.